This is a typical greeting from my friend Mustafa whenever I go to visit him in his shop. Mustafa is a tailor in Abi Adi and his little shop occupies a prime piece of real estate in town, on the way to everything. It’s impossible for me to walk by and not stop to chat. Even if I’m in a hurry I still have to stop and at least say hello. In fact, it’s best to avoid his street if that’s the case since it’s almost guaranteed that you’ll be invited in for some tea. Mr. Mustafa works on shortening some pants. Mustafa saw me pass by his shop as I wandered around town looking like a confused newcomer during my first few weeks in Abi Adi. He promptly invited me in for tea and conversation. He is a very social person and there is almost always a guy or two sitting in his bare little shop passing the time with him. We all watch Mustafa work, fascinated by his slow but deliberate alterations. 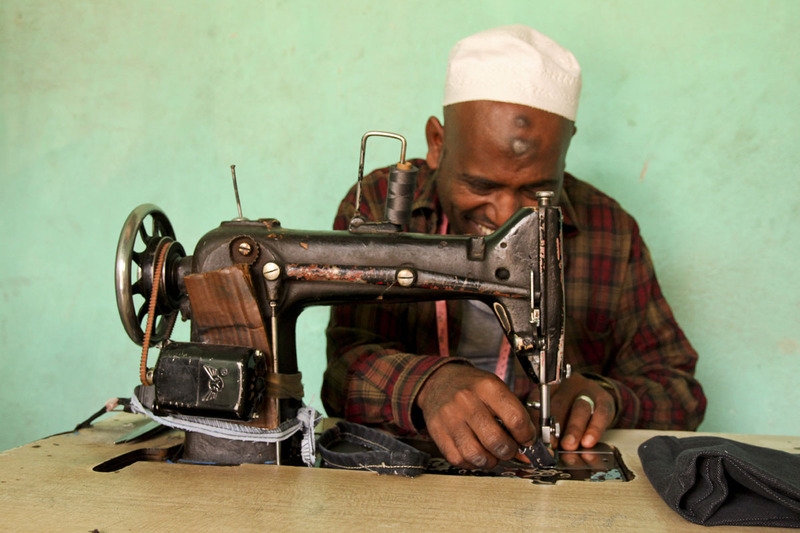 I call him the doctor of clothes: a surgeon who re-hems shirts, shortens trouser legs, or adds badly needed patches to the seat of some worn out jeans. The alterations are usually not taxing enough to draw his attention too far away from the conversation at hand. We’ve discussed all sorts of things over the past year and a half but language comes up often. He speaks Tigrigna, Amharic, Arabic, and English so I taught him a new word: Polyglot – one who speaks many languages. His attempt at the pronunciation is hilarious for an already strange word. To pass the time Mustafa tries to engage in English conversations with everyone including his old Muslim friends who don’t speak any English; it’s a one-way conversation for sure. I got him an Oxford Dictionary and in turn he gives me Tigrigna words to fill up my own little black notebook that he titled Forrest’s Oxford. 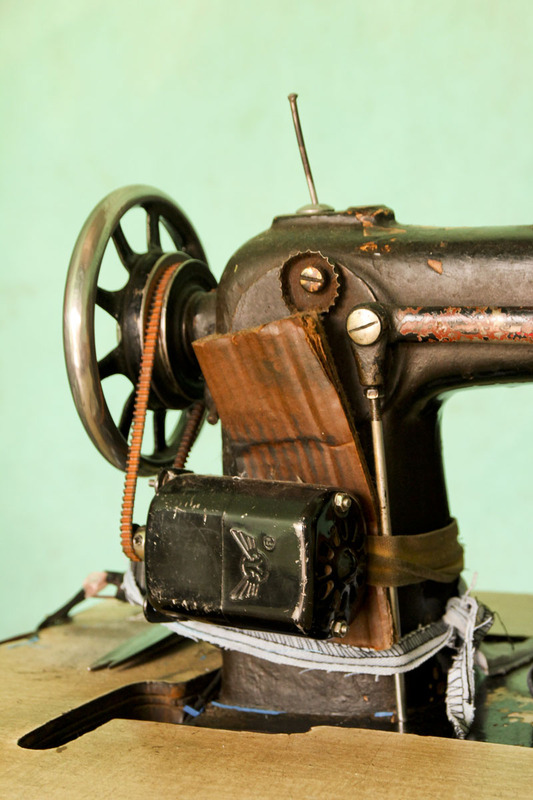 In the shop Mustafa’s main tool is an archaic Mercedes sewing machine that has survived the ultimate test of time. He has hooked up an electric motor to make life easier, but often relies on the foot rocker for manual power when the fickle electricity cuts out. Every Friday night, Mustafa oils his trusty machine in anticipation of the Saturday market. He says, “now I must feed my machine for tomorrow is my Mom’s day,” which means that Saturday is his busiest day and provides a mother lode of work for him; at least I think that’s what he means. His other primary tool is a huge pair of steel scissors. The fingers on his right hand are heavily calloused from the weight of the metal after years of use. Their designated spot on his table has been worn down into a bowl from the contact of the scissor’s pivot screw over and over again. Mustafa is a devote Muslim who never misses a call to prayer. If you pass by his shop during one of the designated prayer times you’ll find it locked up as he is across the street praying. He has a mighty callous on his forehead from bowing in prayer 5 times a day every day. About 30% of Abi Adi’s people are Muslim, while the remaining 70% are Ethiopian Orthodox Christian. This ratio is pretty common in Ethiopia and Mustafa and I have discussed religious diversity in Ethiopia. One of the things I admire most about Mustafa is his devotion to his religion and his simultaneous tolerance and friendship towards other people, even me, a godless heathen secular humanist. Most Ethiopians take pride in the peaceful friendship that exists between the various religions in the country. Both Christianity and Islam have been here for a really really long time, 5th and 7th centuries respectively. They have found balance and mutual respect and have co-habited this country peacefully for generations. There are some exceptions, notably a 16th century attack on Christianity in Tigray, and some modern tensions from radical Islam outside of Ethiopia, but overall things are peaceful. Mustafa and I have discussed how the rest of the world could learn a valuable lesson from Ethiopia’s attitude of live and let live with respect to religion. 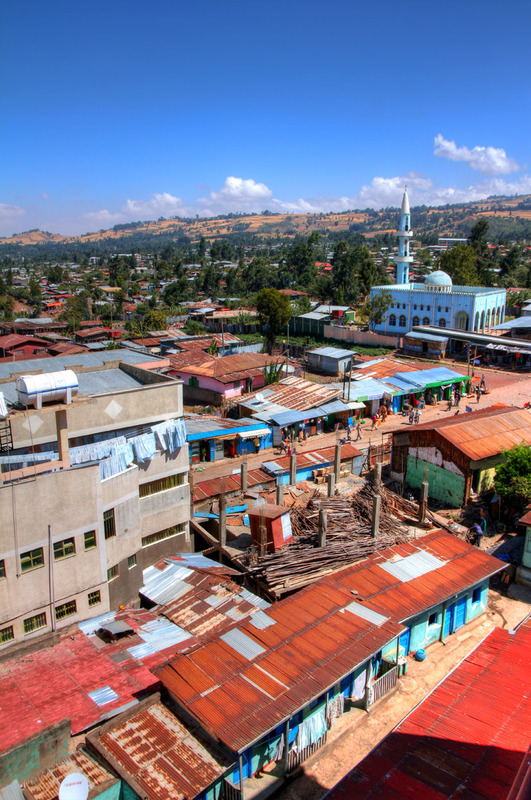 Most Ethiopian towns have Mosques and Churches. You can see one of Asella’s Mosques in this photo. Another key advantage of having a tailor friend is that he can help you find good clothing. 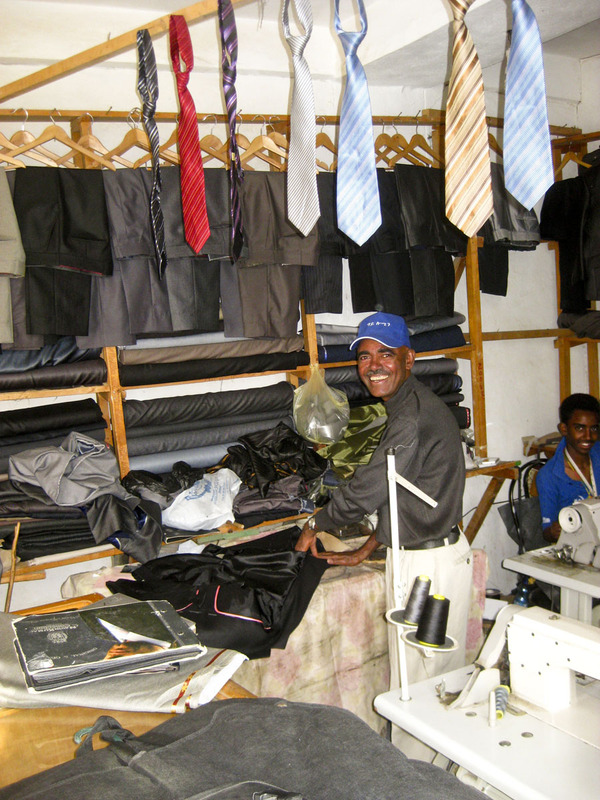 Recently Mustafa helped me order a custom made suit by the best (purportedly) suit tailor in Abi Adi, Wudi Haji. I wanted to get a custom Ethiopian suit for my sister’s wedding in September. 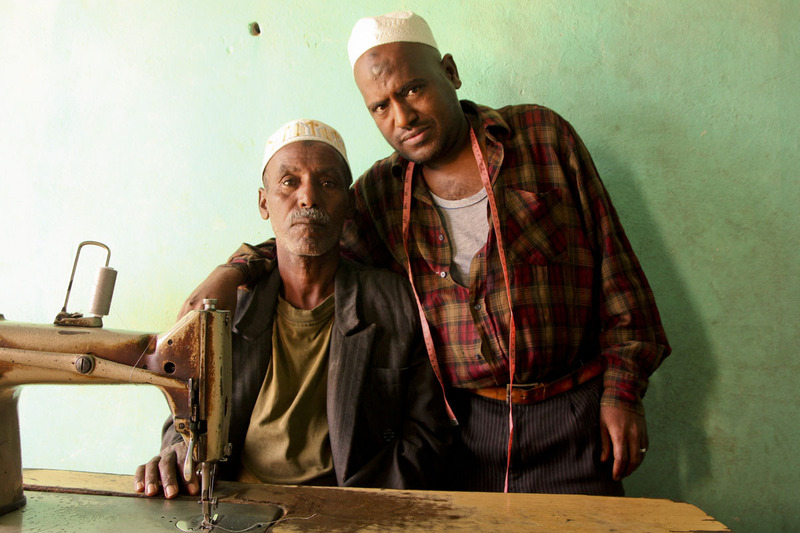 We made a few trips into Wudi Haji’s shop so he could take measurements for the perfect fit. I got the final suit a few weeks ago and it looks…good. I’m not going to post pictures yet because I want it to be a surprise at my sister’s wedding in America. Suffice it to say that it is dark blue and shiny. It will get your attention. Mustafa says that we should have a “suit program” where I invite some friends out to drink sodas and tea, while wearing my new suit of course. 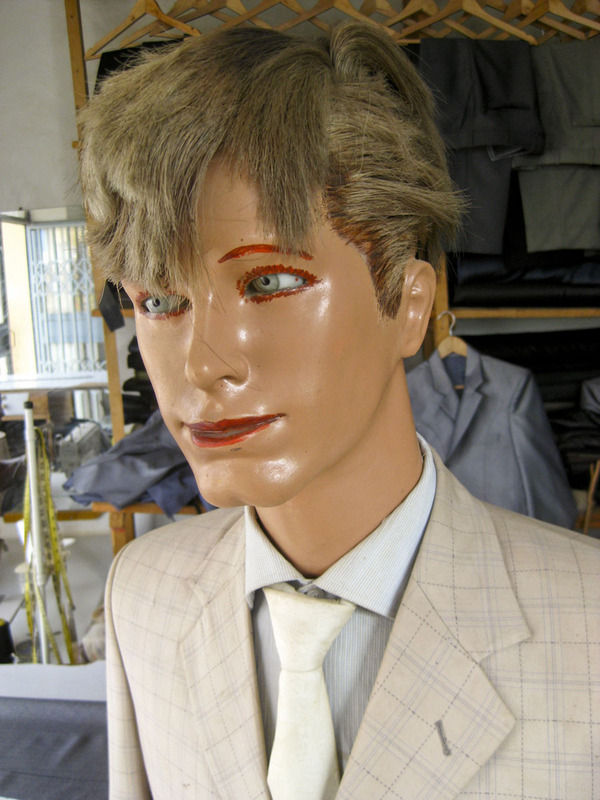 A goofy mannequin models a goofy suit in Wudi Haji’s shop. Mine suit looks much better. Mustafa calls me a famous man because I am recognizable (especially if I wear my new suit) and some people know me. Most people at least know who I am. However, I return the adjective and apply it to him because, as I tell him, he has so many friends here in Abi Adi. I’m glad to be one of them. Mustafa stands with one of his friends who stopped by to chat. This entry was posted in Uncategorized and tagged abi adi, Clothing, Ethiopia, Friendship, Islam, Language, Muslim, peace corps, Religion, Suit, Tailor. Bookmark the permalink. Looking forward to seeing your new suit!